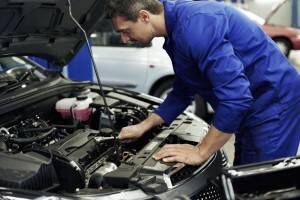 Become Career » What Certifications are Available for Mechanics? What Certifications are Available for Mechanics? While there are many unofficial certifications available for mechanics, there is only one professional certification organization that is considered to be the leader. The National Institute for Automotive Service Excellence (ASE) is the automobile industry’s primary mechanic certification. Keep reading to learn more about which certification the ASE offers. Established in 1972, the ASE is an independent organization that certifies automotive repair specialists. The goal of the ASE it to promote quality automotive repairs services and protect consumers, shop owners and the technicians. There are currently over 300,000 service and automotive technicians that hold ASE certifications. What are the Certification Requirements? Automobile technicians must have relevant work experience to their certificate subject. Every five years, automotive technicians must renew their certification through taking updated tests. The ASE certification tests are designed by committees of experienced automotive professionals, including automotive educators, retired technicians and automobile manufacturers. ASE tests are computer based and offered at monitored testing centers. What are the Work Experience Requirements? Before an automotive technician can apply for certification, they generally must have at least two years of hands-on job training or only have one year of job training with a two-year degree in automotive repair. However, the experience requirements depends on the certification type. For example, repair technicians may be required to have one to three years of experience. However, parts specialists, service consultants and collision damage estimators must have two years of experience. Keep in mind that the automotive experience must directly match the target certification. That is, a school bus repair technician does not have any applicable experience for the automobile parts specialist certification. According to Automotive Service Excellence, there are 16 different certifications available for mechanics that cover many specific services. For example, there are nine A series automobile and light truck certification tests. The A1 certification is for engine repair while the A9 is for light vehicle diesel engine repair. The four B tests concern collision repair and refinish. There are test series for hybrids, electric vehicles, school buses and medium to heavy trucks. On the other hand, there is a C1 test for service consultants that tests their knowledge of sales, customer service and shop operations. The B6 damage analysis and estimating test is not meant for mechanics, but for consultants who assess vehicle damage and estimate repair costs. What is Master Technician Status? Master Technician status is awarded to automobile technicians who successfully complete almost all of the tests in a series. For example, the A series test requires completion of tests A1 through A8, but does not require A9. The Collision Repair test requires the mechanic to pass B2 to B5, but not B6. Two years of work experience and re-certification every five years is required. The ASE offers ample assistance through their website. For example, there are official practice tests available online at a moderate price. There are free, user-friendly study guides available provide details, sample questions and preparation suggestions. There are also useful test taking tips and a computer-based test module that demonstrates the testing format. Finally, there are listed training resources, such as links to training providers, accredited programs and aftermarket test services. To conclude, the ASE is the primary certifying body for automobile technicians. There are basic job experience requirements and 16 different test categories. The certifications available for mechanics prove their competency, knowledge and professionalism.